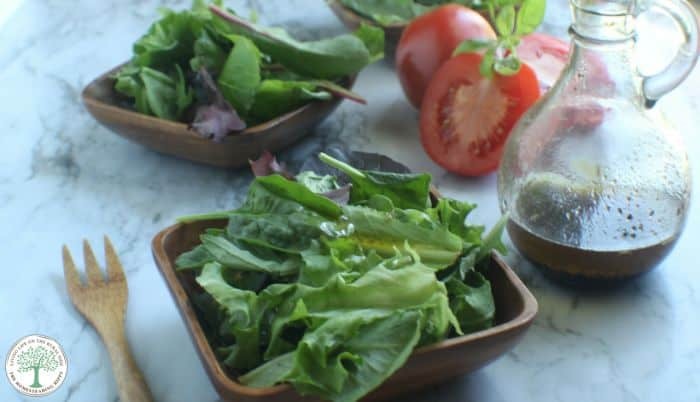 5 easy to make salad dressings that you can customize for any flavor! I love eating salads. My oldest son will eat them, if served when he’s in the right mood. My other two kids don’t “like green foods” but will eat them, if only under duress. Having the same old salad dressing can get really boring. The store bought stuff can get expensive quickly, not to mention all the soy and other GMO’s in them. We love to use homemade ranch on many of our salads, but having something new and different wakes up a tired plate of lettuce quickly. 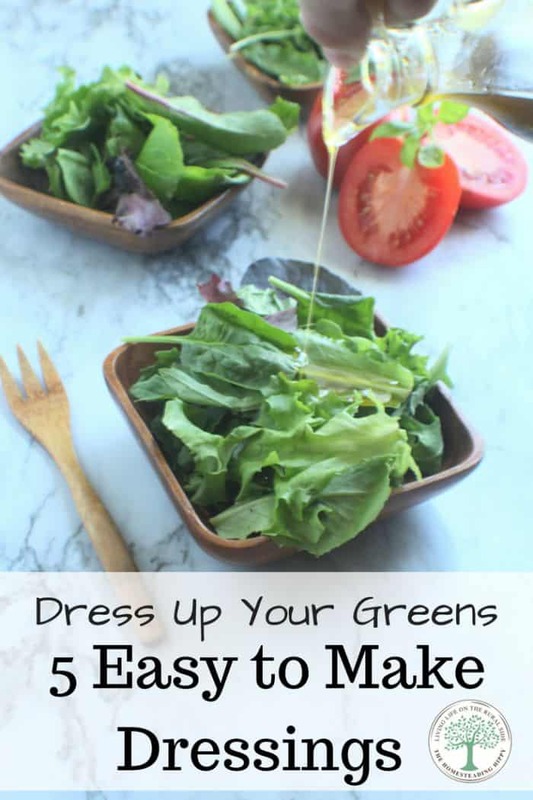 Here’s some of my 5 easy to make salad dressings that you can easily customize or add different spices to and make them your own. Mix together well, and add 1 tsp salt and 1/2 tsp pepper. Toss with salad immediately. You can change it up by adding in a fruit infused vinegar vs. the apple cider vinegar, or substituting with citrus (lemon, lime, grapefruit or orange) juice for the vinegar. Start with basic vinaigrette recipe, but add 1/2 tsp each dried oregano and basil. This recipe is great over a pasta salad, or as a marinade for chicken. 1/2 teaspoon each salt and pepper. Whisk together well, and allow flavors to meld for 15 minutes before serving. Mix together and store in an airtight jar for up to 6 months. To use, simply add 2T. of the mix to 1/2 cup of mayo and 3/4 cup sour cream and mix well. Chill well before use (if you can wait) and use within a week. Mix all the ingredients until well blended. Great over chicken as well as salad greens. Toss with chopped romaine, shredded Parmesean cheese and homemade croutons for a quick and easy lunch. I’m always trying out new ceasar dressings from scratch! Thanks for a new one and some others to try! Oh, my gosh! This is a great blog! Thank you for the recipes and the links to the other homemade recipes! Ok, these are actually easy enough that I will make them! Bookmarked, thank you! I’ll definitely be trying these out. I’ve been meaning to try my hand at making salad dressings, but never quite get around to it. These are so easy though! I love, love, love these and will be making them soon! Thanks so much! I would love to start making my own dressing. store bought dressing has too much unnecessary stuff. Seriously, the more I visit your blog, the more I am inspired and love it. I’ve never attempted to make my own dressing, but this might be the push I need. I really want to do this. Your blog is so inspiring. Great recipes, I always make my own dressing, there’s just too much junk in the dressings at the stores. I will try some of these. My basic recipe is 2:1 oil and vinegar, dijon mustard, spices, easy peasy! I love the idea of making your own dressing. You just never know how long and what exactly is in the bottle dressing you buy at the store. Thanks for sharing! I love salad dressings. I have to try that thousand island one. Wow Your Good Thank You So Very Much I Can’t Wait To Try!! What a great list of salad dressings to make at home! Cuts down on preservative! Thousand Island my favorite !! I’ve never even thought about making my own dressings. Thank you for sharing. Normally I just use olive oil and vinegar, but I like Ceasar sometimes too. I always thought it had anchovies in it though. The blue cheese one sounds great. I used to make my own ranch, but it never came out JUST right. OMG I Love blue cheese, I’m gonna have to give this a try! I love homemade salad dressings. I will be trying out some of those. I get bored of the store bought salad dressings pretty fast. Definitely a must save! I can probably lighten up a few of these for my personal use at home. These sound yummy! I love Caesar but have never thought to make it. Love all the extra resources! Thanks! This is so helpful! We only ever eat the five you’ve listed here anyway. I’m totally going to try to make our own — it’ll help us save money and avoid the junk!